Ancient myths record a time when the sun caused the oceans to boil and the only survivors were those who hid in caves or underground. Apollo astronauts found glazing on Lunar rock samples that astrophysicists said could only have been produced by a high energy outburst from the sun. Physicist Anthony Peratt has found rock art all over the Earth with designs identical to electrical patterns of high current plasma. Peratt argued this could only be possible if the Sun experienced a superflare sometime in the past which produced these designs in the upper atmosphere as intense aurorae which were then recorded in stone by people all over the Earth to document this event. 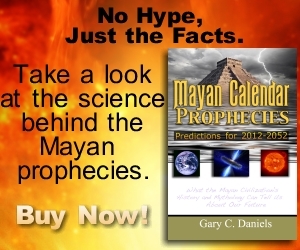 I discuss all of this evidence of an ancient super solar flare in my book Mayan Calendar Prophecies: Predictions for 2012-2052. 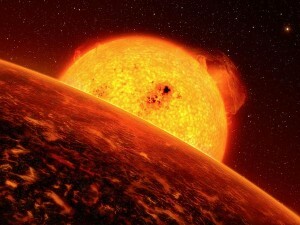 Trigger for planet-roasting outbursts still a mystery, new data suggest. A NASA spacecraft has witnessed hundreds of “superflares” coming from sunlike stars—and the observations suggest that the trigger for such massive outbursts remains a mystery. On our sun, solar flares aimed at Earth can send huge amounts of energy colliding with our planet. If a flare is strong enough, it can cause a solar storm that might cripple satellites and even knock out the power grid. Astronomers have also recorded similar but much more powerful flares coming from a variety of stars. These superflares can be millions or even a billion times more powerful than an average sun eruption, packing enough energy to roast nearby planets whole. It’s not likely, but if a superflare were to engulf Earth, for example, our protective ozone layer would be instantly obliterated, said Brad Schaefer, an astrophysicist at Louisiana State University (LSU) who wasn’t involved in the new study. With no more atmospheric ozone, dangerous ultraviolet rays from the sun would flood the planet, and all life would get fried to a crisp. “If you got rid of the ozone layer on Earth, you would sunburn in one second,” Schaefer said. One Response to "Superflares common on Sun-like stars"